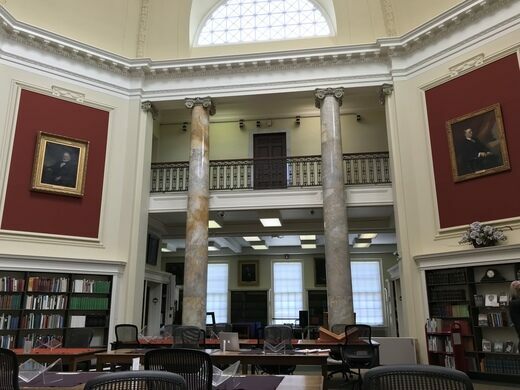 Plenty of people in Worcester drive by the American Antiquarian Society every day, but few know about the vast amounts of knowledge held inside. This research library and learned society rivals the Library of Congress in terms of its historical content. Historians from all over the United States and beyond make pilgrimages to come here to do their research. The institution was founded by Isaiah Thomas, creator of the Revolutionary Era newspaper The Massachusetts Spy. It started with Thomas’ own massive collection of antique printed materials and has since expanded to house millions of books, newspapers, and manuscripts. Many prominent figures, including 14 U.S. presidents, became members to gain access to its trove of historic treasures. It’s said that the society houses roughly two thirds of all the books printed in the country from 1640 up until 1820. One of its crown jewels is the 1640 Bay Psalm Book, the first book printed in North America. The society also holds one of the largest collections of newspapers printed in the country before 1876. Anyone over the age of 18 can become a member for free for life, and once you do, the society will allow you to touch and flip through their centuries-old literature—so long as you have clean, dry hands (no special gloves necessary). Reading and getting intimate with the materials under the building’s dome will give you a sense of enlightenment (and quasi-time travel), as you’re holding what people centuries ago held and reading the very words they read! You generally need to have a project in mind to access the collection. When becoming a member, do bring two forms of identification. Free tours to the public are offered for you to get acquainted with the facilities and what it has to offer. If you wish to make your research here, make sure to check their catalog on their website before requesting anything.